Mrs Elizabeth Nelson (above), a former Napier nurse who tended many New Zealand soldiers under hazardous conditions in the First World War, celebrated her 102nd birthday in Havelock North today. Mrs Nelson, widow of the late Mr George Nelson who developed the historical Keirunga homestead and gardens a recreational area for Havelock North, knew from an early age that her only vocation would be nursing. She began her career as a waiting-room nurse for Dr Edgar Caro in Napier continued to work for him when he set up a private hospital. After three years at the private hospital, compulsory registration of nurses was introduced and Mrs Nelson went to Wellington where she trained for three years. 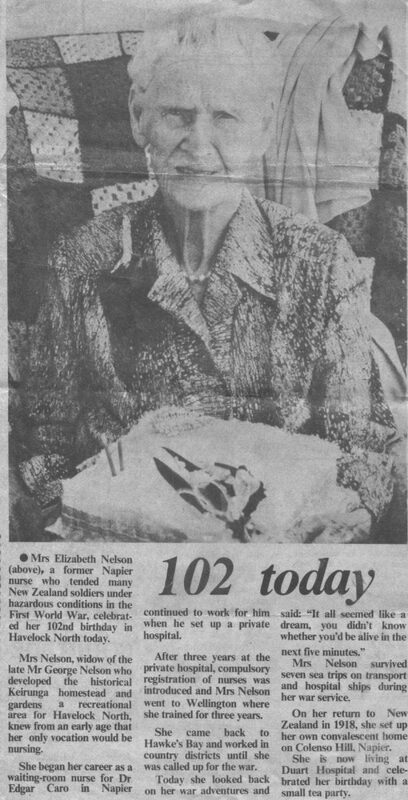 Mrs Nelson survived seven sea trips on transport and hospital ships during her war service. On her return to New Zealand in 1918, she set up her own convalescent home on Colenso Hill, Napier. She is now living at Duart Hospital and celebrated her birthday with a small tea party.